Preheat oven to 300-degrees. Combine first 8 ingredients (dry ingredients) in a large bowl. In a saucepan combine oil, honey, and vanilla and bring to a boil. Let boil for 1 minute then pour over oat mixture. Mix until all ingredients are moistened. Divide and spread mixture over 2 large cookie sheets and bake at 300-degrees for 20-30 minutes. Remove from oven and leave on pans until the granola hardens (it may be a little chewy and that's ok.. if you prefer it not to be chewy at all, allow to dry completely). 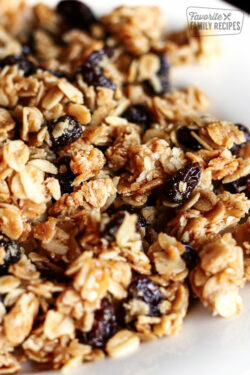 Break up granola and store in large Ziploc bags or containers. Serve plain, with yogurt, or with milk.